So far I've made some mustard and relish and for the last few of our summer cookouts we needed some good old Barbecue sauce. 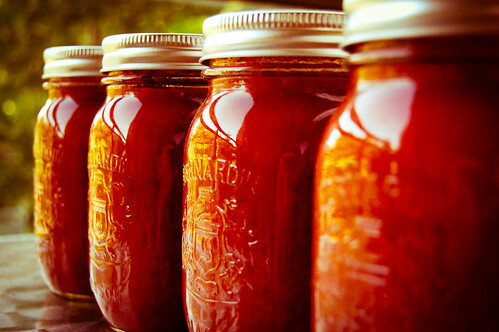 I wanted to start with very basic recipe for our first canned barbecue sauce. The only thing I couldn't resist was adding some more heat. The recipe called for some chili flakes but that wasn't nearly enough so I added some chipotles in adobo. I love the sweet and smokey heat they add to anything and figured it was the perfect addition to give this basic sauce a bit more of a boost. 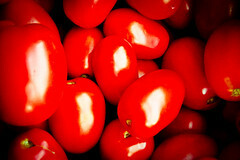 1 - In a stainless steel pot, combine tomatoes, onions, chipotles, garlic, hot pepper flakes and celery seeds. Bring to a boil over high heat, stirring constantly. Reduce heat, cover and boil gently until everything softens, about 30 minutes. 2 - Pass the the mixture through a food mill. Keep passing the seeds and skins through the mill until they are dry and all the pulp has been extracted. 3 - Return the mixture to the pot and boil, stirring occasionally, until cooked down by one quarter. Add brown sugar, vinegar, lemon juice, salt, mace, mustard, ginger and cinnamon. Return to a boil over medium-high heat, stirring occasionally. Reduce heat and boil gently, stirring frequently, until mixture is thickened, about 30-40 mins. 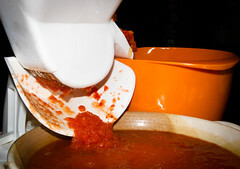 4 - Prepare jars and lids, ladle sauce into hot jars leaving 1/2 inch of head space and remove any air bubbles. Hot water process jars for 20 minutes. Also? I am going to make this RIGHT AWAY. what a gorgeous recipe! can't wait to try it. I just made this - it's YUMMY! I am also trying it with plum puree instead of the tomatoes - thanks for the inspiration! Glad you enjoyed it! The plum puree sounds very interesting!